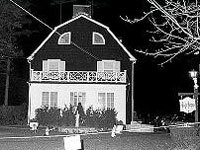 Though the Amityville house is most famously linked to the Ronald DeFeao killings in November of 1974, it was originally used to house Native Americans that were insane, sick or withering. Those Indians were buried on the property, obviously from less than peaceful circumstances. Did these Indians, buried on unconsecrated ground, lend to the later strange tragedy that would make this house so famous? Ịn the early morning hours of November 13, 1974, Ronald DeFeao fatally shot his father, two brothers and his sister. All were found in their beds, face down, and despite the neighbors’ houses being close together, no one heard screams or noises. Mr. DeFeao claimed that ghosts were present during the events and had goaded him into eliminating his siblings though his original intent was just to executing his father. The home at 112 Ocean Avenue eventually went up for sale and was later purchased by George and Kathy Lutz for $80,000. Though they were told by the realtor about the tragedy, the Lutz's were so enamored with the home, pool, garage and 4,000 square feet of waterfront that they immediately made an offer. Moving day should have been a clue when the leashed family dog tried to flee the property, jumped the fence and hung himself. Though the dog survived the ordeal, this was an ominous sign of things to come. What followed could not have been fluffed up any more by Hollywood itself. The Lutz's claimed that keyholes oozed goo, the toilet water turned black, and nasty smells started to permeate the house. Septic problems? George started to get sick and lose weight but if it was a general septic or well problem, the whole family would have been affected, especially the children. Later on noises entered the house. The front door slammed on its own and footsteps pattered about the house. George also stated that 'static' noises could be heard. When he investigated the downstairs area where they thought the source was, he found the furniture moved and the carpets rolled back. At the suggestion of friends who said they too had experienced ghostly experiences, the Lord's Prayer was recited room to room. That's when the noise went from static to full blown words including one screamed phrase, "'Will You Please Stop!" As if that wasn't enough to motivate this family to leave the home immediately, entities gathered strength and started making themselves physically present. Kathy claimed that she felt a presence embracing her from behind. The family claimed they could see eyes peering at them through the windows at night. When they would investigate all they would find were hoof tracks accompanied by the odd squeal. Other sightings included a little boy on the second story landing and a dark cloaked figure. Their daughter Missy then developed a ghostly friendship with someone by the name of Jodie. Missy claimed that Jodie was an angel and could change shapes. Ominously, she said that Jodie had told her, "You'll live here forever." The departure from the home is a bit ambiguous but the way George tells it, the house almost felt like it was coming alive with flexing walls and groans. They decided to make a very quick departure to Kathy's mother’s house during a very stormy night. After the Lutz's fled, they requested paranormal investigators, Ed and Lorraine Warren, to visit the home. The Warren’s went to the house along with a Duke University professor and the president of the American Society for Psychic Research. Their reports included strong clairvisual and clairaudial messages from the ghosts dwelling in the home, air that seemed to "solidify" and Ed claimed that he saw, "shadows along with thousands of pinpoints of light" which was down in the cellar and those shadows tried to push him about, scaring him out of his mind. There was not a person at the investigation that didn't declare the place felt of utter terror. Lorraine declared that the strong-hold from the ghosts would be too severe to ever dislodge. So wretched was the feeling that the Duke Professor rumored to have passed out from fear.